The Cecil John Rhodes statue at UCT has been boarded up, and students are inÂ the second week of their sit-in at Bremner Building. But â€“ beyond the removal of the statue itself â€“ what are the politics and demands of the Rhodes Must Fall movement? RAâ€™EESA PATHER speaks to three students in the thick of it about why they reject white liberals, the importance of creating an intersectional movement, and why they prefer the term â€œdecolonisationâ€ to â€œtransformationâ€. Kealeboga Ramaru (21), Masixola Mlandu (22), and Ru Slayen (22) head into aÂ conference room on the top floor of Bremner Building. They firmly ask staffÂ members already inside the meeting room to leave, and the staffers dutifullyÂ comply, conceding to the students. Ramaru, Mlandu and Slayen are three members of Rhodes Must Fall whoâ€™ve been there since the beginning. They say that the movement has no leaders, and studentsÂ have banded together on a horizontal level to make it all work. Through theirÂ involvement in political student groups, the three have becomeÂ familiar faces on campus. 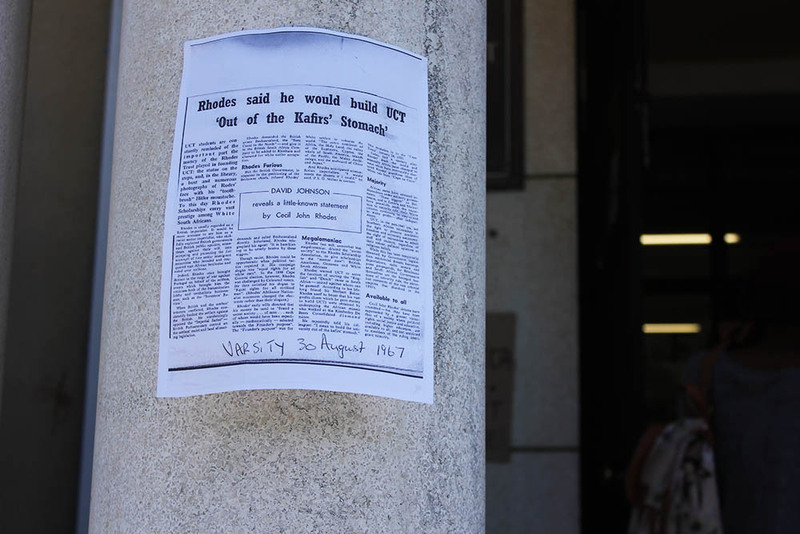 When student protestor Chumani MaxweleÂ threw excrement at the UCT statueÂ of Cecil John Rhodes, it provided the impetus for theÂ students began to embark on a series of protests that would lead them to liveÂ together in occupation of Bremner Building. Maxweleâ€™s protest mobilised smallÂ meetings on how institutional racism and the universityâ€™s lack of transformationÂ could be addressed, and from these meetings Rhodes Must Fall emerged. â€œIn our first meeting we started with speaking about how we were going toÂ address the pain in the room before we started addressing our pain to the world.Â That was about trying to forge this space where everyone could be welcome,â€ saysÂ Slayen, an honours student in applied mathematics. Although the majority of the movement comprises black students, whiteÂ students have been active in the campaign, too. In some instances, though, their rolesÂ have been restricted. On Sunday, Rhodes Must Fall invited â€œall people of colourâ€Â within the movement to an â€œimportant meetingâ€, from which white students wereÂ excluded. This raised tensions on social media. But it was a considered move. Drawing on black consciousness principles, the campaignÂ has limited the involvement of white people to ensure that black people remain leaders of the movement and to safeguard it against white liberalism. â€œThis is not about the statue, itâ€™s about us. Itâ€™s us finding a community within UCTÂ that represents us in the manner that we want. Hence, we are always criticalÂ about who speaks about our movement â€“ the white liberals and all those people [who don’t understand],â€ saysÂ Mlandu, a humanities student majoring in political science and sociology. The politics of Rhodes Must Fall are still undefined, locked in what Ramaru, an honours student in gender and transformation, calls an â€œexploration phaseâ€. TheÂ movement has attracted students from all backgrounds, political influences, andÂ ideological creeds, bringing robust debate and difference into the campaign. Their buzzword is intersectionality, particularly the intersection of BlackÂ Consciousness, Pan-Africanism, queer politics and black feminism, which are allÂ represented through the body of students in the movement. The three students The Daily Vox spoke to represent some of this diversity: Kealeboga belongs to Say-F (South African Young Feminist Activists), a black feminist student group; Â Slayen is part of the the Left Studentsâ€™ Forum; andÂ Mlandu belongs to Pasma (Pan Africanist Student Movement of Azania), the PAC chapter at UCT. While their politics might be uncertain, the movementâ€™s demands are clear:Â calling for the inclusion of an Afrocentric curriculum, the promotion of workersâ€™Â rights and an end to outsourcing, and the employment of more black academics. The students have rejected transformation as a superficial catchphrase andÂ instead specify that the university must be decolonised.Â â€œFrom the time that it was colonised there was never an attempt to decoloniseÂ the university. The university culture is still very white, itâ€™s very elitist,Â patriarchal, and itâ€™s very heteronormative,â€ Ramaru says. UCTâ€™s Student Representative Council has endorsed Rhodes Must Fall, and SRCÂ president, Ramabina Mahapa, helped accelerate the movement after he led aÂ walkout against UCT management two weeks ago. But the movement, although appreciative of the SRCâ€™sÂ support, has maintained independence from the student governing body, beingÂ â€œfully aware the SRC as a body operates inside of management structuresâ€, asÂ Slayen says. 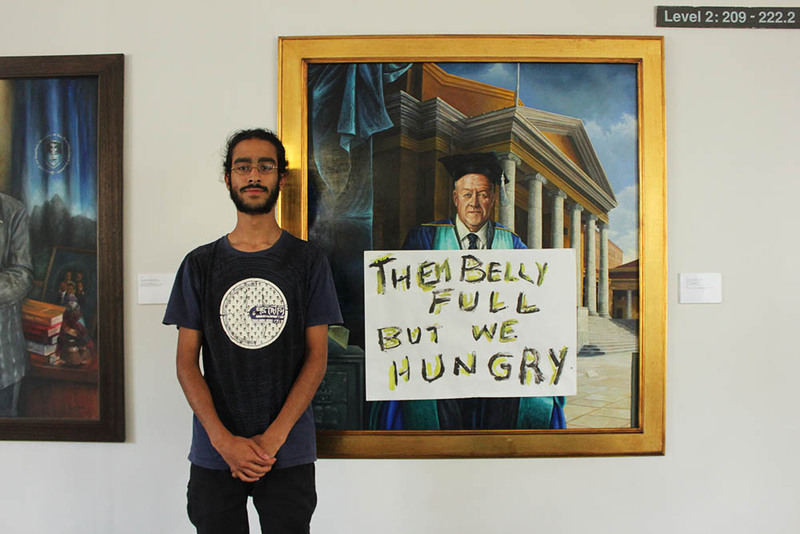 Despite being in such close quarters with UCT management, in the heart of theÂ universityâ€™s administration block in Bremner, the students have shown noÂ interest in negotiating with management, particularly on terms set byÂ management. â€œAny engagement on managementâ€™s terms around this thing will be silencing toÂ us. Their attempts to engage us havenâ€™t been with the people who have theÂ problem, itâ€™s been this kind of pseudo-democratic â€˜Letâ€™s hear what you thinkâ€™,â€Â Slayen says, citing the universityâ€™s Have Your Say discussion boards, which wereÂ tainted with racist commentary from students. 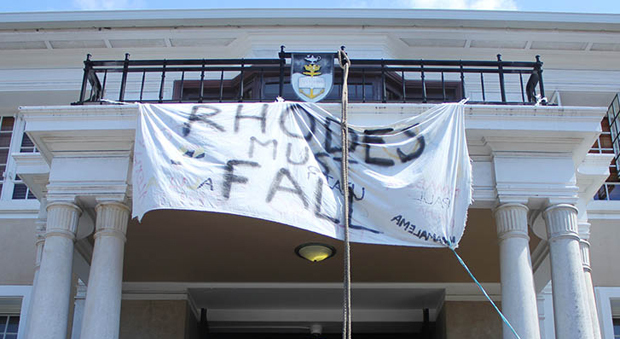 Vice-chancellor Max Price has proposed that teach-ins and seminars be held toÂ educate students unaware of the harm of Rhodesâ€™ legacy, but the movement has rejected the idea. Although students are entering the second week of their occupation at BremnerÂ Building Â â€“ which they have now dubbed Azania House â€“ theyÂ show no sign of relenting. Theyâ€™ve kept the movement alive through protestingÂ in shifts while their comrades attend lectures, and the establishment of sixÂ subcommittees to sustain and organise the movement: education (the RhodesÂ Must Fall literature includes writings by Biko and Fanon), radical action (whichÂ includes protests), writing, creative expression (such as performance protest),Â media relations, and support (which includes food donations). The university Senate has approved the statueâ€™s removal, and Council is set toÂ confirm or deny the Senateâ€™s proposal for the statueâ€™s removal on 8 April. ButÂ students may well occupy Bremner until the university and its management haveÂ met their complete demands for decolonisation. – All images: By Raâ€™eesa Pather.